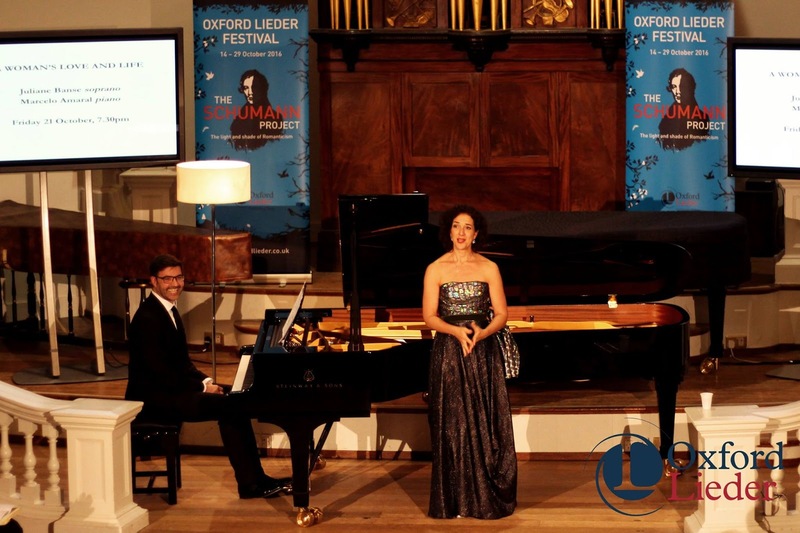 The final concert in my day at the Oxford Lieder Festival on 21 October (see my previous reviews of the Bach Revived lectures, and the daytime recitals), was recital from soprano Juliane Banse and pianist Marcelo Amaral, at the Holywell Music Room, performing Schumann's Fraueliebe und -leben, Op.42, Gedichte der Königin Maria Stuart, Op.135 and Requiem, Op.90 No.7, plus songs by Mendelssohn and Brahms. When Juliane Banse came on, she apologised saying that she had arrived in Oxford the previous night with a slight cold, but that this had got worse so she did not know what was going to happen. In the event she sang the entire programme, and though clearly suffering due to the cold, the result was a triumph of artistry and technique over physical problems. True there were occasions when it was clear Banse's voice did not quite do what it was supposed to do, but such was her skill and ability to communicate that what we took away from the concert was the sense of a highly satisfying exploration of the songs. Banse's voice was soft-grained yet vibrant. She sang from memory and the whole programme was richly complex and communicative with a lovely combination of sense of line and projection of text. She opened with a group of Mendelssohn song. Frühlingslied was almost impetuous, full of suppressed excitement. The two Suleika songs were both full of affecting lyric passion, either side of a finely phrased account of Der Mond. Marcelo Amaral introduced Andres Maienied 'Hexenlied' with a finely dramatic piano, whilst Banse sang the song quite lightly but with a strong sense of the words. A group of Brahms songs followed and here we could appreciate the greater complexity and emotional depth which Brahms could bring to his songs. Bei dir sind meine Gedanken combined a light but richly texture piano accompanied with Banse's lovely floated, fluttering vocal line. An die Nachtigall unfolded gently with a sense of elegant melancholy whilst Wehe, so willst du mich Wieder was darkly intense. There was a quiet controlled beauty to Die Mainacht, whilst Auf dem Kirchhoff was again dark and intense with a dramatic piano introduction, yet a surprisingly calm end. Feldeinsamkeit had a sense of calm disturbed by the restlessness of the harmony, and the group concluded with the lightly skittish Ständchen. Banse and Amaral returned after the interval to perform Schumann's Fraueliebe und -leben, Op.42. Seit ich ihn gesehen was quite understated but her warmth of tone brought great expression to the song. Er, der herrlichste von Allen was lightly impetuous, communicating great delight both with voice and facial expression. Ich kann's nicht fassen, night glauben vividly tumbled over itself, whilst Du Ring an meinem Finger was calm and beautifully shaped. In Helft mir, ihr Schwestern Banse really made the emotions seem fresh and vivid, and for all the intensity of Süsser Freund, du blickest there was a freshness about it too. An meinem Herzen, an meiner Brust positively joyous, sung in an engaging manner, whilst the final song Nun hast du mir den ersten Schmerz getan was quietly yet strongly sung, both serious and sombre, with a lovely sense of the last verse drawing in to itself, followed by the magical piano postlude. Gedichte der Königin Maria Stuart, Op.135 had been one of the subjects of Richard Wigmore's lecture earlier in the day, and listening to the songs we were able to notice the influence of Bach in the counterpoint in the piano. The vocal line in these songs is really stripped back, so that in Abschied von Frankreich we could appreciate Banse's plangently expressive singing. Nac der Geburt ihres Sohnes was quite a plain prayer, yet Banse and Amaral made it rather moving. An die Königin Elisabeth was intensely dramatic, with an underlying bleakness. Abschied von der welt was giving with moving simplicity, almost starkness, and the cycle ended with Gebet, strong and intense with the organ-like accompaniment. To round things off finally, there was a beautifully lyrical account of Requiem, Op.90 No.7. The applause at the end was, rightly, extremely warm. We were on the edges of our seat all evening, not through anxiety over whether the singer would make it to the end, but simply through being so strongly engaged by a real master of her craft, or rather two masters because throughout Banse was beautifully partnered by Marcelo Amaral.